The view on Spring Hill Drive, looking south in the direction of Fairmount School at mid-morning Monday. 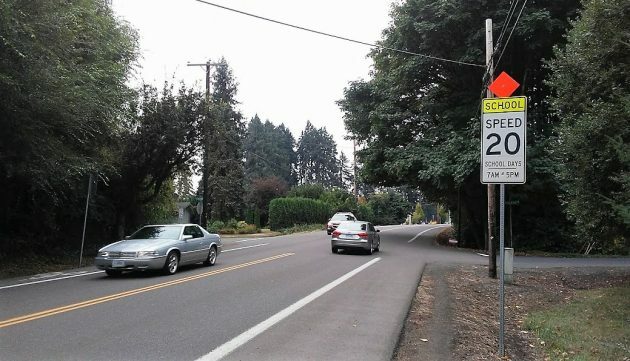 On school days, when the speed zone is in effect, the behavior center at Fairmount has up to eight children each in the morning and afternoon. They are there because because they may act out. Once, as witnessed by the staff member who told me about this, one of them did a runner and got as far as the roadside before being restrained. Other than the occasional emergency vehicle, it seems quite simple. Slow down and watch the road rather than those critically important text messages you’re receiving. It is not difficult to imagine that 99% of what happens in Albany could easily operate in 20-mph zones citywide. It’s just not that important – whatever it is you’re doing. I travel that road every day. Seems like a caution sign would be adequate. If the standard were to protect from everything possible; no one would be permitted to drive.